Close to Durbuy, this charming, tastefully fitted out holiday home, can accommodate from 2 to 4 people. Created in the left wing of the owners' beautiful stone house, you'll enjoy plenty of privacy: separate entrance, private terrace and unrestricted access to the house's garden located below. 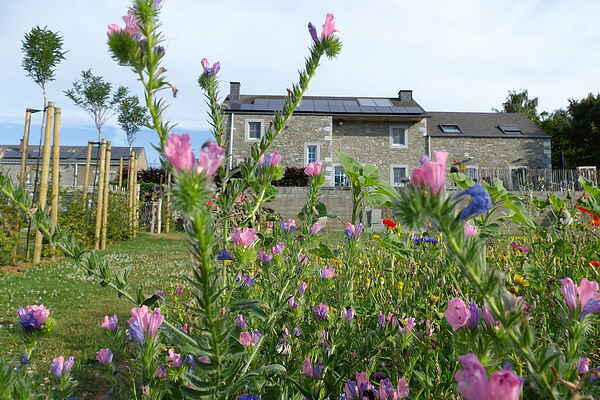 The panoramic view over the Condroz valley and flower meadows is splendid. An outdoor jacuzzi (for 5) is available to relax in during the day or early evening, for example after a day out walking! Numerous walks or bike rides await you in the region. The town of Durbuy is approximately 15 minutes away by car and is absolutely worth a visit. Be sure not to miss the Condroz's typical villages like Anthisnes either, or Modave and its chateau. Many attractions for young and old are accessible from the cottage: Barvaux summer maze is 17 km away, Aywaille's wild world is 30 km away, and there are the shops and museums in Huy (20 km) and Liège (30 km).